SWQ Thunder Football Club is now calling for nominations for three (3) positions for Directors on the Board of SWQ Thunder Football Club. These nominations need to be returned to the Returning Officer of South West Queensland Thunder Football Club Limited before 5.00pm Monday 3rd February 2014. 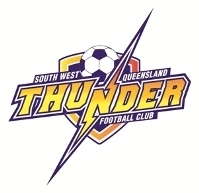 SWQ Thunder Football Club provides a football career pathway in the National Premier League (NPL) for those elite players that will represent the South West Queensland Region. Click on the following pdf documents for more information along with the Candidates Nomination Form.